Promoted Accounts. Twitter looks at your current followers and then finds people with similar interests. When it discovers a match, Twitter recommends you in the “Who to Follow” section. Promoted Tweets. Twitter monitors your engagement, and then promotes what it determines are the best tweets based on retweets and @replies. You only pay when someone follows your account or engages with your Tweets. Here’s how to get started using Twitter Promoted Accounts and Tweets. 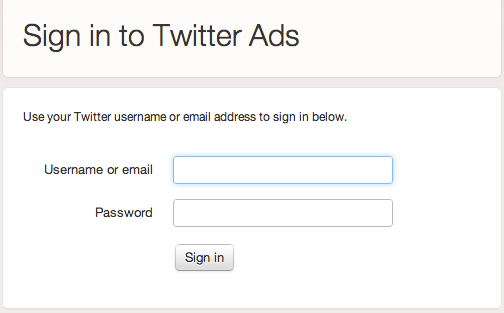 Go to ads.twitter.com and login using your Twitter account credentials. Click the blue “Get started” button. Select locations you wish to target. This targeting applies to both Promoted Accounts and Promoted Tweets. You can choose to target the entire world, certain countries, or limit your reach to U.S. metropolitan areas. Choose the amount you wish to spend on Promoted Accounts. Select a daily budget that you’re comfortable with — $1.00 is the minimum daily amount. Twitter will automatically stop promoting your account once you reach this limit. Allocate a greater portion of your budget here if your focus is to gain new followers. Choose the amount you wish to spend on Promoted Tweets. If your goal is to promote a special offer, launch a product or announce an event, allocate more budget for Promoted Tweets so that your messages reach more of those who are likely to have interest. Select your budget for Promoted Tweets. Enter credit card information to complete the process. 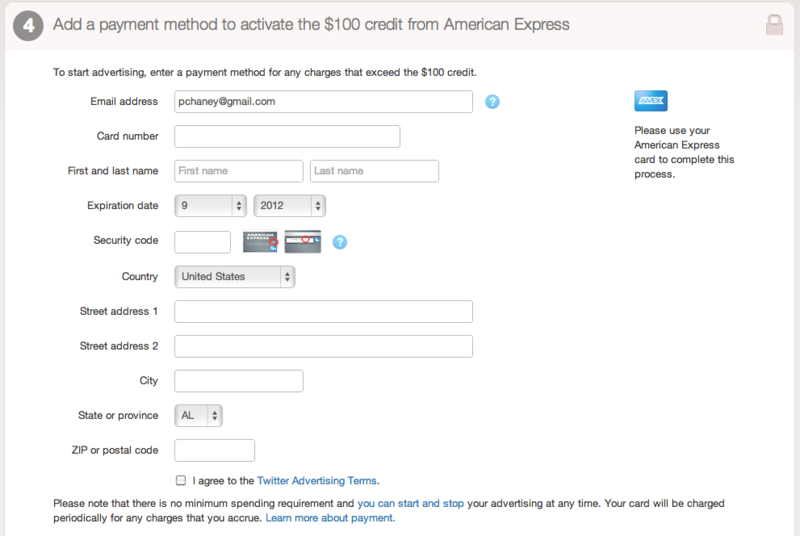 Currently, American Express is offering a $100 credit to merchants. 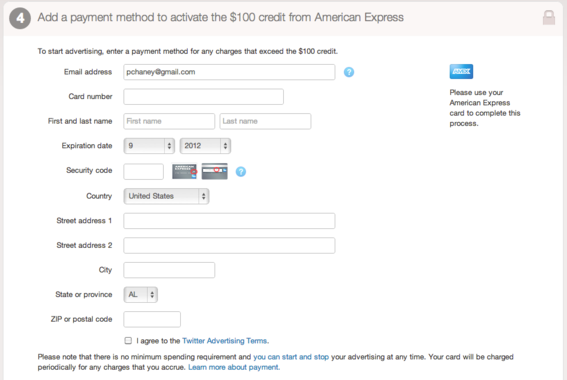 The form indicates that merchants are to enter a “payment method” for charges that exceed the credited amount. Even though Twitter’s help center states that Twitter accepts Visa and MasterCard, when I attempted to use Visa, a message appeared stating that an American Express card was required. Most likely, this is due to Twitter’s partnership with American Express, which I explained in “Ecommerce Comes to Twitter,” my previous article on that topic. Once credit card information has been added, click the blue button to start the ad campaign. Twitter recently added a tracking function for Promoted Accounts in the form of a chart that gives account owners an at-a-glance view of their Twitter audience growth. Both paid and unpaid followers are included. Track follower growth with this chart. In response to advertiser requests for more control over which Tweets are promoted, Twitter now offers a manual selection option in addition to automatic selection of the most engaging Tweets. 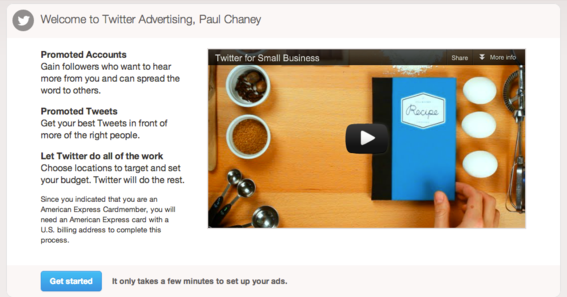 Using the manual option, merchants can select a few Tweets for promotion or Tweet from within the interface. Manually select Tweets to promote. More attention. Promoted Tweets are displayed at the top of your followers’ feeds, providing optimum placement to capture their attention. More followers. Because Promoted Accounts are included in the “Who to Follow” section of other Twitter user’s accounts, to increase your chances of growing your follower count. Geographic targeting. Twitter’s location targeting enables merchants to focus on specific geographic locations, which is especially useful for businesses with brick-and-mortar stores. Twitter offers three resources to help small businesses maximize the value of the platform. In addition, Twitter has produced the following video for small business advertising.